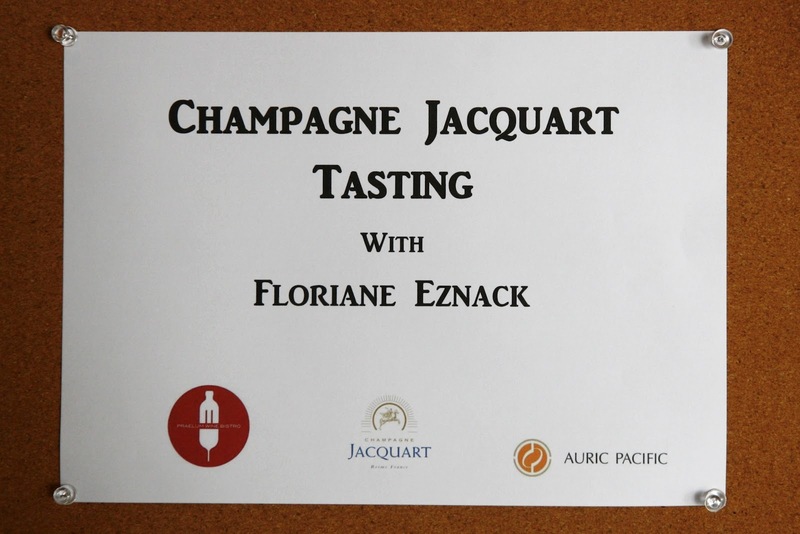 Ms Floriane Eznack, presently a wine maker with Champagne Jacquart, was recently in Singapore to introduce some of its wines to the folks in the wine trade over here. Auric Pacific (a local wine distributor) played host while Praelum Wine bistro at Duxtion Hill offered its place for the tasting. Since these wines were still ‘unchartered sips’ for me, I took the opportunity to go hear about the producers, taste their wares and take some pictures of this session. Ms Floriane attest her interest and love for wine to her father. A wine lover, he used to guide her in her youth by sharing with her his love for wine and spending time indulging in ‘blind tasting sessions’ with her. She went on to cultivate knowledge about things wine by attending several winemaking courses and working as a cellar hand with winemakers. 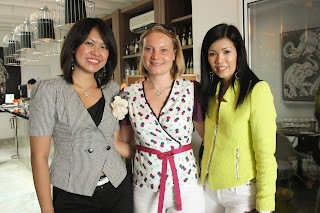 In 2004 she graduated from the Reims Oenology School and in 2006 began work with Veuve Clicquot. Jan 2011 saw her filling the position of Head winemaker at Jacquart and her involvement with this brand ever since. This brand began 5 decades ago when a group of growers decided to produce champagne under their own label rather than be contented with merely growing grapes and selling them to middlemen and existing champagne houses. Call it restlessness, discontentment, growing aspiration, wanting to ensure the continued survival of their vineyards or striving for a better control over their own destiny (could be one or a combination of reasons), the growers set about producing wine under the Jacquart label. Fast forward 35 years and in 1998 three growers’ co-operatives came together to form the Alliance Champagne Group which presently manages the Jacquard brand. Being a ‘grower co-operative producer’ has its advantages. The Alliance Champagne Group works with 1800 growers and operates 2400 hectares of land (which roughly represents around 7% of the land under vine in the Champagne region). These growers are located all over the Champagne region with grapes being mainly sourced from Marne Valley, Montagne de Reims, Cote des Blancs and Cote des Bars. 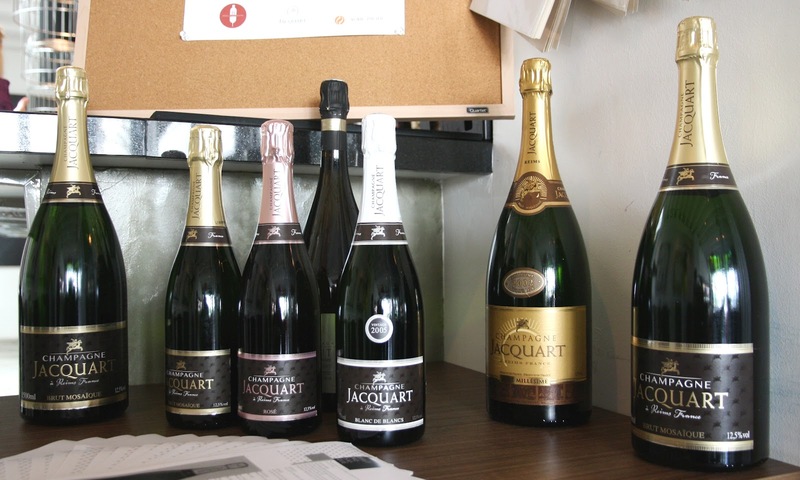 These factors help Jacquart with having a ready access to grapes grown in different terroirs from which to craft its champagnes. 1. The non-vintage Brut Mosaique (a wine made since Jacquart’s beginnings ). Dominated by chardonnay and supported by pinot noir and pinot menuir, it sells on its freshness. 2. The non-vintage Rose (known as the Brut Mosaique in ‘pink’). 3. The non-vintage Extra Brut conveying a drier expression of the regular Mosaique with extra aging on the lees made to add complexity and character to the wine’s body. Its first release into the market was in 2007. 5. The Nominee made from the best crus of chardonnay and pinor noir (like those found in Mailly, Avize and Chouilly), and aged for 6 years in cellar before release. During the trade tasting in Singapore we had the opportunity to taste 5 of its champagnes. Champagne Jacquart Brut Rose Mosaique N.V. Champagne Jacquart Brut de Nominée 1999. The Burt Mosaique and Brut Rose showed themselves as easy drinking sips showcasing freshness, fruit expressions and a pleasant finish. Both the Blanc de Blancs and the Mosaique 2002 displayed more character in nose and palate, certainly showed a firmer structure and a complex body than the earlier two wines. These 2 wines were the favourite of the trade folks for this session; the group almost equally divided in favouring one or the other.The Nominee 1999 was a curiosity; brooding and still evolving, it has some years to go before it fully expresses itself. Consumers would do well to let this Nominee age a little longer before popping one for a curious sip. In one way Champagne Jacquart can be viewed as a ‘new comer’ into the champagne producing fraternity. It does not have a ‘long’ history which some houses like Moet & Chandon, Lois Roederer or Pommery can lay claim to. But then again every champagne House has to begin at some point in time, sustain itself against trials and succeed over time before history gives us a story to tell. We can happily note that the Jacquart has of recent survived through 50 years of operation and is growing successfully. Its champagne is presently distributed in more than 60 countries (the top 3 being France, UK and Germany) and sales of 3 million bottles in 2011 gives hint of its success. (If you like to see some pictures taken during the trade tasting in Singapore, you can take a peek in www.facebook/spiceinwine ).